Well, I did make one change to the era that's actually a lot more significant than Geoffrey's date of death or John's ability with a claymore. And that's attitude. The real gut-wrenching question at the core of (artificial) cloning is the fact that human clones in science fiction are generally created not to be beings in their own right, but to take the place (or provide spare body parts!) for their primogenitors. In other words, they are textbook examples of treating the subject (an individual) as an object (a thing). That's as bad as it gets, morally speaking. It's the early '60s. There's this young guy, quiet, lanky, big nose. Loves mythology, the Bhagavad Gita, martial arts. Comes out of Columbia with an MA in Elizabethan drama, goes back to his home state of Ohio and starts working for the Social Security office. Evenings and weekends, he writes fantasy and science fiction, working his way up from short stories to novels. 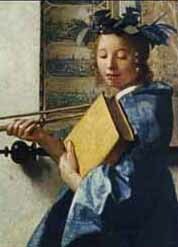 That's Clio, the Muse of History. It was me, in the secret underground cavern of Excalibur, with the text of The Wrong Sword. TWS is set in the High Middle Ages, about 1190 CE. Some historical figures make an appearance - hence my earlier posts on the Plantagenets (which I promise I'll get back to...er, eventually). Eleanor of Aquitaine shows up with her Court of Love, and her sons Geoffrey and John, and Raymond of Toulouse. But, well, I made some changes. We improve the breed by sticking ourselves full o’ junk – personality modifications, physical improvements, etc. etc. Or maybe we use drugs or genes instead. See also “Human Evolution.” Body modification is also one of the recurring themes in the biopunk sub genre. Say, Did I Mention Medieval Drinking Songs? We've consigned entire classic F/SF novels to obscurity - Jack of Shadows, The Eyes of the Overworld, Stand on Zanzibar - so what chance do individual short stories have? Let's save some of these gems. For this post, the short story is Green Tea, by Richard Wadholm. Published in 1999, anthologized in the 17th Year's Best Science Fiction, it combines vengeance, disaster in space, and advanced particle physics, and serves them up with an elegant Spanish accent. It is tasty, my friends. You can find it as an individual ebook at BarnesandNoble.com. Only $1.39. And you can download the Nook app onto your laptop or iWhatever for free to read it. Wainscoting is wood paneling for walls. It's also a term used by F/SF writers to describe a fantasy in which a magical world exists side-by-side or hidden within the mundane world...just as elves might be hidden in the wainscoting of the family manse. It's very common in contemporary fantasy: Harry Potter is a wainscot fantasy, as are Percy Jackson and The Dark Is Rising. The Dresden Files is a good example of wainscot urban fantasy for adults. 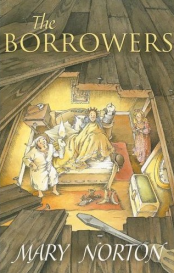 In the YA classic The Borrowers, the main characters are literally (sorry) in the wainscoting. By contrast, Lord of the Rings is a "secondary world" fantasy - Middle Earth is its own fictional world, and isn't connected to the real "primary world" at all. The idea of Mankind creating life - especially intelligent life - has been around forever, a subset of the Promethean Myth...we get too smart, we get too uppity, and disaster ensues...or not. 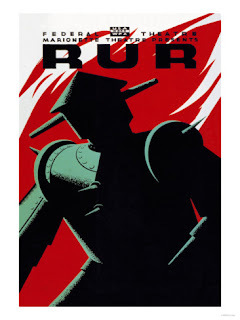 For SF purposes, "artificial intelligences" or "AIs" are artificially created beings, usually computers, that are self-aware; "robots" are AIs that can move themselves and other objects; and "androids" are robots built to look and sound like human beings. 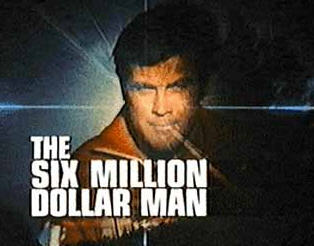 Cyborgs, on the other hand, are organic beings with cybernetic replacements, like The Six Million Dollar Man. -is either smart or stupid, I'm not sure. But I'm also working on a second book, a NON-wainscot contemporary fantasy - or alternate world fantasy, depending on how you look at it - and it's kind of taken up squatter's rights in my temporal lobe, where I keep important stuff like phone numbers and the lyrics to filthy medieval drinking songs. So I guess I'm going to have to write it all out of biological storage and onto the page. One of the things I like about reading "old" science fiction is seeing little bits of history cemented into the story - details, attitudes, and customs that the writer clearly thought were mundane and just "the way everyone did it," but were actually very much a part of the writer's time and place. Examples after the jump. -when I lived in a (North) Hollywood bungalow, and swam in a (tiny, run-down) swimming pool with palm trees overhead, I read (horrifying) screenplays for a (meagre) living. I accumulated some writing tips that I will scatter throughout these posts, among the sotletie recipes and paeans to dead pulp authors. Because at this blog, we are all about the chunky writer goodness. I'm up in the middle of the air, sitting literally higher than anyone in America could have done two hundred years ago, and I'm looking out on other tremendously tall buildings. It's a view no one could have imagined. I'm living in the science fiction of the 18th Century. 30 degrees outside, and the heating pipe just burst in my building. Okay, it's not as bad as all that. 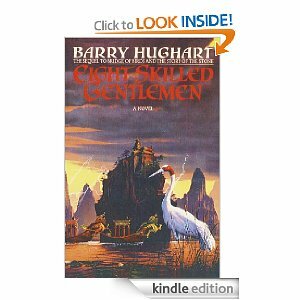 So there's this writer, Barry Hughart. And he writes these three terrific, virtually unclassifiable fantasies...think Sherlock Holmes meets The Sandman, set in Medieval China...and funny. In fact, he wins a World Fantasy Prize for The Chronicles of Master Li and Number Ten Ox. But he and the publishers get into a big tiff and the series ends after three books, instead of the planned-for seven, and all the books disappear from view. Ten years after their original publication, an omnibus version went for $50 - if you could find it. But now, thanks to ebooks and the Internet, Master Li and Number Ten Ox ride again! Hardcover omnibus, sure, for $40...but also as an ebook for $10. And you, lucky you, can buy the three books on Amazon or Barnes & Noble. Some side notes after the jump. I've posted about Harlan Ellison, Cordwainer Smith, and Isaac Asimov, and it occurs to me that all of them had interesting lives outside of their careers. Ellison ran away to the circus and worked, lived and partied in '60s Hollywood. Smith was the godson of Sun Yat-Sen, a friend of Chiang Kai-Shek, a pioneer of psychological warfare, and a doctor of Asian literature and history. Asimov was a professor of biochemistry who worked at the Philadelphia Naval Yards during World War II (along with L. Sprague de Camp and Robert Heinlein) and served in the army afterwards. Heinlein was an engineer who served in the Navy, sold real estate, mined silver, was active in politics, and invented the waterbed. They were all engaged in the world around them (even though Asimov was a bred-in-the-bone New Yorker who liked enclosed spaces and was afraid of flying). But a lot of F/SF folks today are part of a fan culture they see as a refuge, a place to hang out with like-minded enthusiasts. If more and more writers emerge from that culture and not from the world at large, will their stories have the same impact? "Apocalypse" is Greek for "revelation," but has come to mean the end of the world thanks to the Apocalypse of St. John, better known as The Book of Revelations. "The Singularity" is the idea that our technology (specifically, our information/intelligence/computer technology) will soon improve at such a rate that it will be incomprehensible to us, and ultimately lead to an unpredictable event that will so alter us or the world that we will be unrecognizable. Popularized by Ray Kurzweil, its roots were laid out in a 1993 paper by Vernor Vinge, who noted that the key element of the Singularity would be "technological runaway." Anticipation of the Singularity has since become the central tenet of Trans-Humanism. "Isaac Asimov": 8.8 million Google hits. "Cordwainer Smith": 274,000 Google hits. I've always liked Asimov, and I can quote the Three Laws of Robotics by heart. But if you want to talk about stories that burrowed into my brain and stay with me now, thirty years later, it's Cordwainer Smith, hands down. And nobody knows who he is. Once they were abstract concepts, metaphors, or simply undefined "messengers" (the original meaning of malakh, the Hebrew word for "angel.") Since at least the 17th Century, however, angels and demons have been mythologized as entities who could be commanded and feared - and then turned into characters of fiction. Modern fantasy, especially, has treated these beings as just individuals with great power, wisdom, and life span, following the lead of John Milton and taking it even farther. What was that one movie exception? It's after the jump. ...and that idea is a list of the books that first laid out the Big Ideas in SF. The ones you should really know if you're going to play in the sandbox. If you want to write post-nuclear dystopias, you should know A Canticle for Leibowitz. If you want to write about STL interstellar travel and you haven't read Vernor Vinge's A Deepness in the Sky, you're doing yourself no favors. In other words, these are the stories an F/SF writer should know so that he/she can avoid reinventing the wheel.